With a long established business designing, sourcing and supplying interior accessories to the super yacht industry, at Gillian Weir we truly understand luxury. This background knowledge has lead to us to specialise in the finest fibre in the world – cashmere. Our luxurious throws, blankets and cushions marry the best of English design flair with the traditional techniques of our hand weavers in Nepal. Private client – pricing will be provided. Interior Designer – trade pricing will be provided. Retailer – wholesale price list will be provided. All orders are confirmed by way of payment. Each and every piece is custom made to order, generally we hold no stock. Lead time is approx. 6/8 weeks, from confirmation of the order. At this point we will be able to provide you with an estimated delivery date. If you cant find the perfect colour within our colour palette of 46. We have a larger colour palette of 170 available, please get in touch for further details. All custom colour matching needs to be sampled. This will take approx. 2/3 weeks to arrive. Once the colour is confirmed, usual production and lead time of approximately 6/8 weeks will commence. To enable us to achieve the perfect shade we create 3 colour samples for you to select from, the cost for this is £100. Swatch books, containing woven samples of our 46 colours are available upon request. These are charged at £60.00 (inc VAT). For orders over £500 the cost of the swatch book will be credited. Cashmere is one of the finest natural fibres in the world. By its very nature is precious and delicate fibre that requires a little more care and attention than other wools. This is a natural, hand woven, custom dyed product, whilst all care is taken to ensure accuracy the colour, weave and size may vary slightly. Take extra care with sharp objects and jewellery as the weave may snag. Take extra care if removing labels as the fibres in this item are very delicate. Cashmere has its own natural oils within the fibre, therefore any throw or blanket may initially have a slight odour, following storage. Please allow a couple of hours airing time, which will eliminate any odour. As all of our throws, blankets, bedcovers and cushions are custom made you can have whatever size you require. Please find the below guide to help you in confirming the size required. Relaxed throw – We believe 130cm x 180cm is the perfect size for a relaxed throw, whether it be draped over the edge of a bed, or used for snuggling under on a chair or sofa. Bed Throw – Having a throw with a perfect drop really finishes off a bed set beautifully. Please bear in mind the height of your bed and mattress depth. 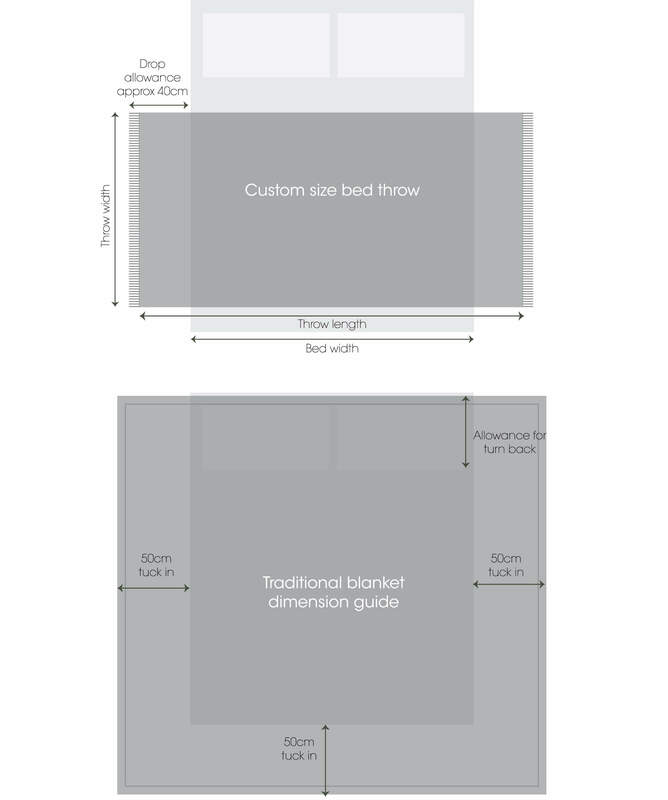 Blanket – A traditional blanket can be used instead of a duvet, if this is the case, please bear the following measurements in mind when considering the size required. For the width add 100cm to the width of your mattress. This allows a 50cm tuck in. Then add 60cm to the length of your mattress. This allows for a fold back at the pillow end of the bed and enough for a tuck in at the base. We offer shipping across the globe, all fully insured and tracked. Due to quantity, size and value, shipping costs vary. Where delivery point is known, we can provide an estimate at point of order confirmation and this will be added to your quote. Due to the very bespoke nature of our products, we cannot accept returns.